We are heartbroken to announce that on August 28, 2017 our dear husband, dad, grandpa, and great grandpa passed away. Bill is survived by his wife of 62 years and best friend, Ann, by his daughter Linda (Rick), sons Brian and Ian (Julie, Kirk, Clay and Trent), grandchildren Dan, Rachel and Reid, great grandchildren, Maia and Aubrey, and sister Alice (Carl) and many nieces/nephews. He was predeceased by his parents, Henry Valli and Mae Krogh. 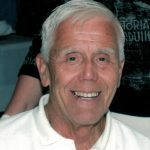 Bill lived a full life including flying which he loved, hiking, camping, biking, scuba diving, and some travelling. He was born in Sturdee, B.C. on February 5, 1933 on the CPR tracks (which he loved to talk about). He moved to Chase when he was 6 and lived there until adulthood. He then joined the RCMP, training in Regina. After a time he left the RCMP and then moved on into the insurance industry and was an insurance adjuster for I.C.B.C. until he had to retire for health reasons. At retirement, he and Ann moved to Chase for a number of years and then returned to Kamloops. Bill was a friend of Bill W. for 54 wonderful years. Thanks for caring. Love Ann and Family. Bill will be missed . He was one of those old timers who was greatly respected. I did not know of his passing until I returned home from holidays. Please know you will be in my thoughts and prayers Ann . Please accept my condolences to you Ann and to your family. Bill gave strength to so many people he was a good man. Thank you for your kind words and for caring. Remember when we stayed with you, it does not seem so long ago. We have missed not being able to travel these last few years. Hope you are both doing well. Ann there are no words that will soften your grief but l wish all those wonderful memories of your life together will ease the sense of loss you and yours are feeling at this difficult time. My condolences. We are so deeply sorry for your loss. Bill’s vitality and enthusiasm was inspiring, and we will truly miss his generosity of spirit. May peace and love always surround and comfort you. Thank you so much Larry, your condolences are appreciated. Ian and Family, we are so sorry for your loss. R.I.P. Bill till we meet again. Thanks for caring. It was so nice to see you at the celebration. Our condolences to the Valli family. Bill impressed us as a true gentleman. My sincere sympathies to you all in the loss of your husband and dad. I have very fond memories of living across the street from the Valli’s! Mom and I ran into Bill and Ann a number of years ago and it was so nice to catch up. Take care and know you are in my thoughts. Thanks for caring. So nice to hear from you. We also have fond memories of growing up on Rosewood. I have told my 7 year old granddaughter about the clubhouse we had in your backyard and how much fun we had. We hope you and your family are doing well. Joanne, I would occasionally see your mom at the grocery store and always have a chat with her and would see her walking near Cottonwood Manor as we lived close by. When we did not see her anymore, we assumed maybe she moved to be near you. Our deepest condolences to all the Valli Family. Our thoughts and prayers are with you. I was saddened to hear of Bill’s passing. He always had a smile for me. I will miss seeing him in his red sweater at meetings. Sending you my love. Thanks for caring. So nice to see you at the celebration. Dear Ann, please accept on deepest sympathy on the loss of your beloved husband Bill. May he rest in peace & eternal light shine upon him. God Bless. For Anne, Please accept my deepest sympathies for your loss. Bill was an inspiration and example for me during my early years as a friend of Bill W.